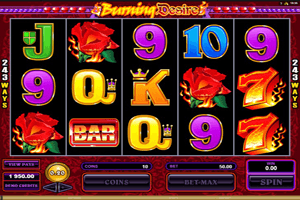 Burning Desire is a romantically themed video slot machine that was launched by Microgaming around Valentine’s day. It is a game that can be enjoyed by lovers as they stay in the warmth of their own home while enjoying a romantic themed slot while earning great rewards instead of going out and wasting money. Since the game is themed around Valentine ’s Day and romance, players will see that the color red is the one that dominates the entire interface of the slot machine. Play Burning Desire Slot here. The symbols that appear spinning on the reels of the slot machine include flowers, a golden coin, a diamond, golden bar symbols, fiery sevens, golden bells and much more. Players can earn great rewards through the game’s line payouts as well as through the special symbols and bonus symbols that the game has to offer. Players can check out the different payouts and special features of the game by clicking on View Pays to open the paytable of the game. The Golden fiery coin is the scatter bonus of the slot which means that players who are lucky enough to get three of these symbols on the reels of the game will trigger fifteen free spins. There is also a wild icon which is the logo of the game which helps players greatly in forming winning combos by replacing other icons.